Oscoda junior Braden Mallak wrists the game tying shot in for the Owls. Mallak would also score the game winning buzzer beater. MIO, MI — Oscoda (5-0) and Mio (4-0) are two of the top teams in the North Star League this season. They had their first clash of the season as the Thunderbolts hosted the Owls. Mio took a 12-8 lead after 1 thanks in big part to Drew Hess’s eight in the quarter. Brayden Mallak paced the Owls with four. The second quarter was quiet for both teams. Jacob Post scored Oscoda’s lone bucket on a free throw, while River Waisanen accounted for four of Mio’s six for a 18-9 halftime score. The Owls began coming back in the third. They held the Thunderbolts to six points while scoring twelve for an end of third score of 24-21. The fourth quarter saw the most exciting part of the game. Brandon Mills and Waisanen each hit threes to keep Oscoda’s comeback at bay. Gabe Kellstrom responded with a three of his own with just under 3 minutes remaining. Brayden Mallak tied the game shortly after Kellstrom’s three. The Owls opted not to foul and allowed Mio and Hess to run out the clock. Hess’s go-ahead shot missed and Owen Franklin was able to grab the rebound. Oscoda quickly called timeout. With 3.2 seconds remaining, Devin Thomas inbounded the ball to Mallak. Mallak made some nice moves and danced his way to a buzzer beating, go ahead game winner 35-33 Oscoda. The win improves Oscoda to 6-0, while the loss is Mio’s (4-1) first of the season. 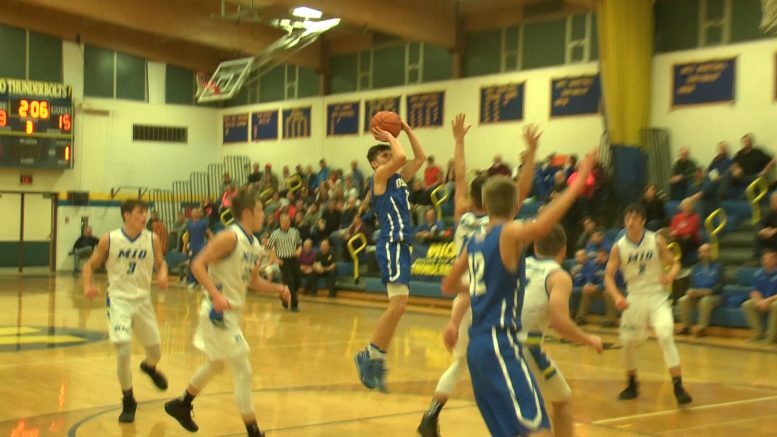 Oscoda is at home against Tawas on Tuesday, while the Thunderbolts will look to rebound against the Hurons Monday in Rogers City.